Baltimore Catechism 3. 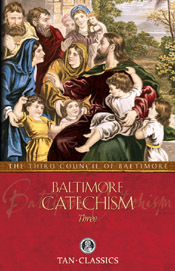 The lessons contained in Baltimore Catechism No. 3 are intended for students who have received their Confirmation and/or high schoolers. It includes additional questions, definitions, examples, and applications that build upon the content of the original Baltimore Catechism (No. 2).